Many hunters are looking for the next Whitetail Buck to put on the wall. Some are looking for a tall Typical 150 inch 8 pointer, while others are in search of a Non-Typical 200 plus trophy. Whether it is one of those or any other size of Whitetail Deer, there are many things that are a factor in the antler growth. Important factors of Whitetail Deer antler development are Genetics, Nutrition, Age, and Injury. 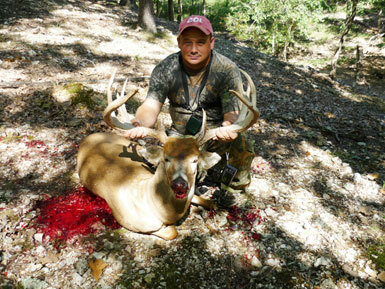 Genetics are a very important component of a Whitetail Deer’s management composition. To understand the role that genetics plays in antler development, it is first necessary to understand the contributions of other factors that affect a Whitetail Buck’s antlers. Most importantly, the Whitetail Deer has to have sufficient nutrition. Without sufficient nutrition a Whitetail Buck with the genetic background to become the world record Whitetail Buck might be less than average. Calcium and phosphorus are the most abundant minerals in a Whitetail Deer’s antlers averaging about 22 percent. A hardened Whitetail antler is 50 to 60 percent mineral, with the remainder mostly protein. Studies have shown that acorns can constitute 38 to 76 percent of a Whitetail Deer’s diet in November and December. Age can also affect a Whitetail Buck’s antlers. Whitetail Deer do not achieve maturity until they are 5 to 7 years of age. Studies have showed the average Whitetail Buck achieves only about 10 percent of his potential antler development by age 1.5 years (at the completion of his first set of antlers as an 18 month old buck). By the time a Whitetail Buck has completed his second set of antlers, he still only has achieved only 25 to 35 percent of his potential antler development. At 3 years of age a Whitetail Buck still only has achieved about 50 percent of his potential antler quality. Not until 5 to 7 years of age that most Whitetail Bucks approach their full antler potential. The best indicators to determine the age of a Whitetail Buck is by the diameter of the antlers and by its teeth while the number of points is less accurate. Injuries to a Whitetail Buck’s antler while they are still in the velvet will often result in odd points, double main beams, or other unusual traits. Overall, Whitetail Deer antler injuries of this type do not result in antler abnormalities during the following years unless they occur near the base of the growing antler or to the skull. If the injury is close to the base of the antler, it can result in unusual development in following years as well as the present year. Injury to other parts of the skeleton can also result in unusual antler growth during later years. With all of the above in mind, High Adventure Ranch has over 30 years experience in raising and breeding Trophy Whitetail Deer. Check out our Whitetail Deer Photo Gallery to see the proof.